Property Size 2,252 sq. ft. 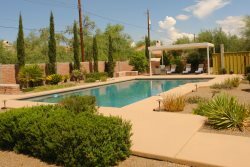 The wonderful, spacious, adobe home in the north west area of Tucson is the right spot for your retreat! Come and enjoy this ranch style home set on one acre with a private pool. The home is located close to dining and shopping, yet has the feel of the serene desert. The private pool is not heated.